Nigeria's Apex bank, the Central Bank of Nigeria (CBN) said that members of the public should return unfit naira notes to banks or any of its branches in exchange for fit notes. It also warned the commercial banks against recirculation of unfit bank notes, saying that it would impose penalties on any bank that re-circulates unfit bank notes. The CBN revealed this in the Banknotes guidelines issued yesterday alongside Clean Notes Policy. The documents were signed by the Deputy Governor Operations, CBN, Folashodun Shonubi and Director Currency Operations Department Mrs. Priscilla E. Eleje. 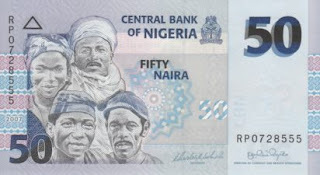 The guidelines also describe fit and unfit bank notes as well as stipulate Quality Standard for Nigerian bank notes. The guidelines described a fit note as “A banknote that is suitable for continued circulation and is sufficiently clean to allow its authenticity and value to be readily ascertained. It also described unfit notes as “A banknote that is unsuitable for further circulation because of its physical condition, which may be soiled, dirty, limp, worn out, defaced or has a hole that is larger than 10 mm. Explaining the purpose of the guidelines, the Apex bank stated: “These guidelines provide the general public with clear, acceptable criteria and standards for determining the quality of banknotes in circulation. The guidelines highlight the criteria for re-circulating a bank note, saying, “A banknote is considered fit for recirculation if it meets the following criteria:-Genuine, not counterfeited; Has a defined and acceptable area dimension; Free from holes, tear, tape or missing part, folded portion, etc; Has uniform brightness and is not heavily soiled; Free from excessive ink wear, particularly in the portrait area; Free from defacing; Correct denomination, serial number details, etc; The series that has been approved for redistribution by the Bank. A note can be classified as unfit and unsuitable for recirculation if one or more of these criteria are not met. ”To ensure that the banknotes in circulation are clean and of good quality, DMBs shall ensure that they process their banknotes using registered processing companies and classify them into fit and unfit. “Any counterfeit notes discovered are to be returned to the Central Bank of Nigeria. Only the banknotes which have been authenticated (i.e. verified for counterfeit and free from unfit notes according to CBN standard) will be issued over the counter by banks or through their cash dispensing machines. “Unfit banknotes shall not be re-circulated by DMBs and CPCs. However, a penal charge of N12,000 per box, or any amount determined by the Management of the Bank, shall apply for the deposit of unsorted banknotes. In addition, penalties as may be determined by the Bank, shall apply for the re-circulation of unfit banknotes.